If you’re not already a Bob Dylan fan then let Cate Blanchett convert you with her remarkable performance in Todd Haynes new release I’m Not There. It will automatically lead you back to D. A. Pennebaker’s observational documentary of Dylan’s 1965 English tour which informs much of Blanchett’s interpretation. Shot in dodgy black and white this intimate portrait captures a 23 year old Dylan skulking behind his black wayfarers and challenging any journalist who dares to call him a folk singer. 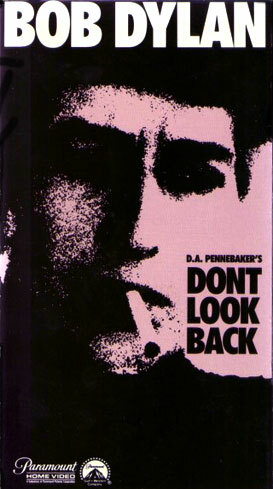 Starting off with the famous film clip to ‘Subterranean Homesick Blues’ in which Dylan scrolls through a bunch of cue cards while Allen Ginsberg warms himself by a fire in the background, the film follows the young musician from his arrival at Heathrow airport to his departure three weeks later. And in between we see him making concert escapes with cling-ons on the limo and typing out lyrics as his soul sister Joan Baez sings songs on her guitar. Later Donovan offers up a number and Dylan reciprocates with a tasty rendition of ‘It’s All Over Now, Baby Blue’. Behind the scenes deals are negotiated between his manager George Grossman and television executives for exclusive interviews with the highest bidder. And we’re just flies on the wall. It’s a rambling yet riveting expose of an artist on the verge of a major breakthrough. Dylan was just about to release his first electric album ‘Bringing It All Back Home’ and this tour marked the close of his acoustic period. At the Royal Albert Hall he stands on stage, a pale and solitary figure with bandy legs and wayward hair, playing his guitar and harmonica in front of an adoring full house. It may have been the end of an era but it was the start of something truly enduring.